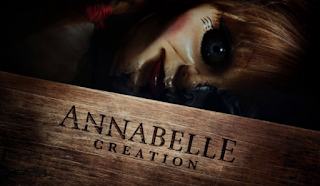 Home » Past Screenings » Download ANNABELLE: CREATION Screening Passes! Download ANNABELLE: CREATION Screening Passes! Download screening passes to see ANNABELLE: CREATION. She’s back! From New Line Cinema’s highly successful horror universe that always keeps audiences on the edge-of-their-seats comes the next chilling installment of the possessed doll, Annabelle, who we first met in “The Conjuring.”In ANNABELLE: CREATION a dollmaker and his wife welcome a nun and some girls from a shuttered orphanage into their home several years after the death of their little girl. But, soon after that, the nun and girls become the target of the dollmaker’s creation, Annabelle.The film is directed by David F. Sandberg (“Lights Out”) and produced by James Wan and Peter Safran. It stars Stephanie Sigman, Talitha Bateman, with Anthony LaPaglia and Miranda Otto. NO PURCHASE NECESSARY. Passes available on a first-claim first-serve basis. You will need to register for a free WBTickets account in order to redeem the passes and each registered user account is limited to claim one admit-two pass. SEATING IS LIMITED, SO ARRIVE EARLY. PASS DOES NOT GUARANTEE A SEAT AT THE SCREENING. Refer to screening pass for further restrictions.